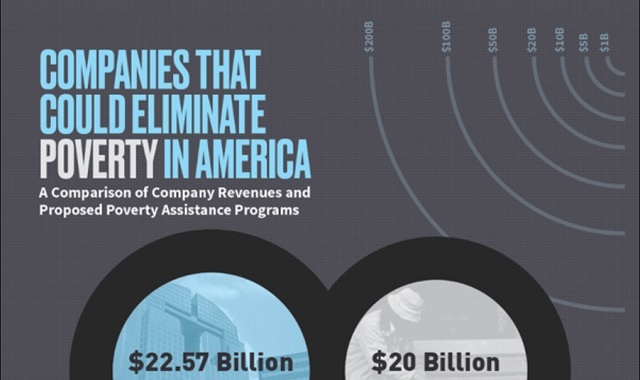 Companies That Could Eliminate Poverty in America #infographic ~ Visualistan '+g+"
Many speculate on how much it would cost to eradicate poverty in the United States. Experts have estimated that it would cost anywhere from $1.74 trillion to a few billion dollars for specific programs. However, it is incredibly difficult to visualize just how vast these sums are. To help put these numbers into perspective and to shed some light on the current economic climate of America, this infographic from TitleMax compares the annual net incomes of large companies with the estimated money needed to eliminate hunger, homelessness, and fulfill the needs of other social programs. For example, the U.N. determines that it would need $267 billion to end world hunger. It would take the combined annual net income of 10 major companies (Berkshire Hathaway, Wells Fargo, Comcast, Microsoft, Bank of America, UnitedHealth Group, Altria Group, Walt Disney, Walmart, and Google) to reach this sum. The combined net income of Johnson & Johnson and Proctor and Gamble could fulfill the estimated $11 billion cost for a Federal Paid Maternity Leave Program. While resolving poverty is far more complicated than re-distributing wealth, this infrographic from TitleMax does provoke questions and reflection on America’s society.